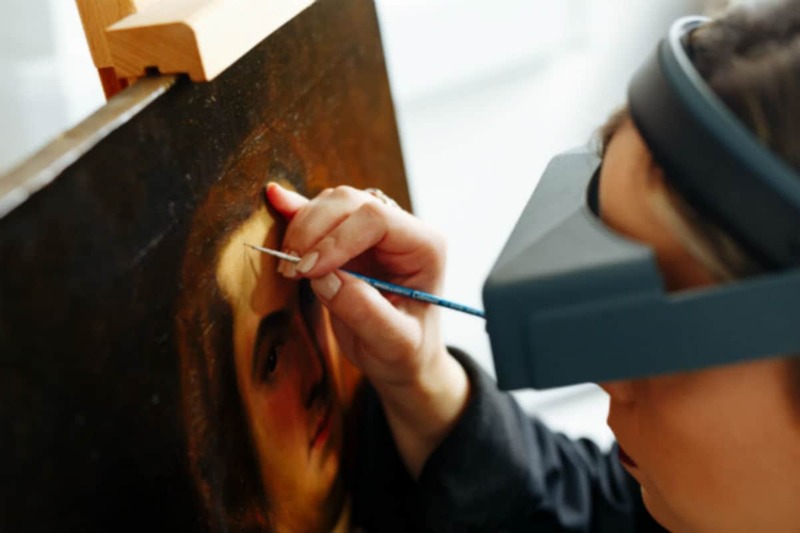 When a painting requires retouching, we are careful to only ever apply conservation paints that have been precisely colour matched to the existing pigments of the artwork. We retouch the areas of an artwork where paint is missing, for example through flaking or lost paint or after repairing a hole in the canvas. What we don’t do is make a heavy intervention with overpainting, which means covering areas of the artwork with a layer of paint. Our retouching policy is always where it’s necessary to do so, and completed to always complement the artwork as it exists. It’s not unusual to receive paintings into the studio that have suffered from overpainting. It can be immediately obvious in discrepancies of style and pigments where paint has been generously and unnecessarily added. If an artwork has been handed down through generations or purchased at auction, it can be impossible to fully know why overpainting occurred. Perhaps an owner took a dislike to a certain feature of the painting, or it was a misguided effort to rectify damage. Why is overpainting a problem? By adding paint over an artwork, any problems that relate to its condition can be masked or made worse. If overpainting was an attempt to hide flaking or lost paint, then the original paint layer will not be stable. Flaking or lost paint has not been correctly consolidated and stabilised, and with time the problems previously thought dealt with will persist. From an aesthetic perspective, crucial key details of the painting could also be lost or drastically altered. The authenticity of the artist’s style is compromised, and in some cases the subject will be severely changed. 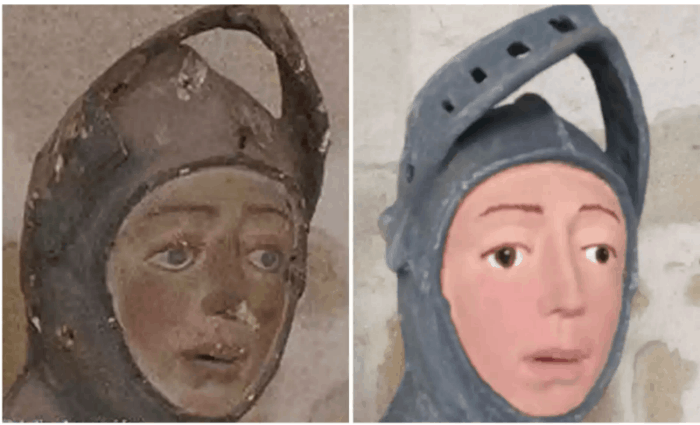 No better example could be provided than the recent spate of botched restorations in Spain, where a heavy layer of paint dramatically (and quite literally) altered the original artworks beyond recognition. For paintings where provenance is easy to research, the differences between the original condition of the artwork and its altered state can be alarming. Any art collector who is considering selling their artwork may find that the value can be greatly affected. How can overpainting be fixed? Overpainting can carefully be removed in a conservation studio. Solvent testing to determine the best method for removing the varnish layer (which protects the overpaint), will be carried out. 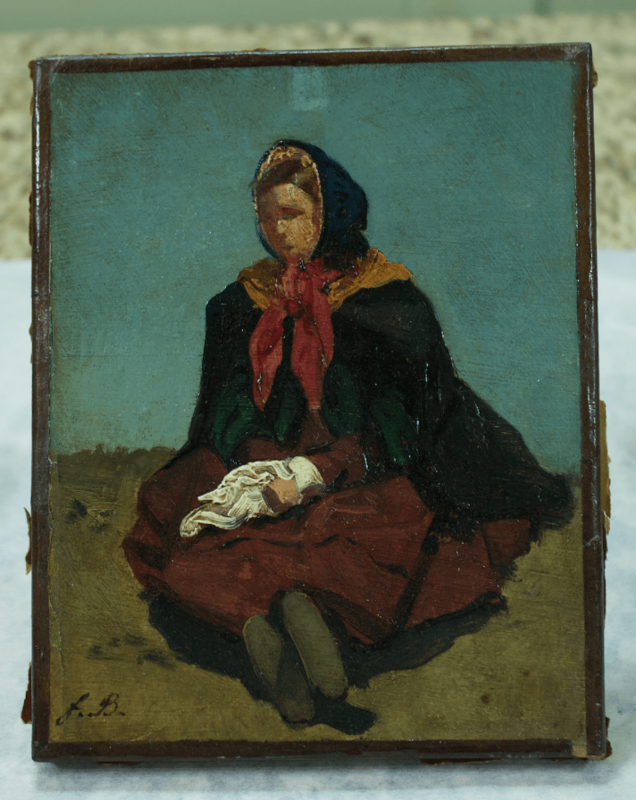 Once found, it can be applied to the painting, which will simultaneously remove the varnish layer and the overpainted areas. Once the overpaint has been taken off the artwork, the original paint condition can be assessed underneath, and treated in the same way as any other painting that arrives in the studio. It will be carefully studied, and a treatment plan created to address specific issues, such as previously hidden tears or holes. Any areas of lost paint can be retouched sympathetically, in accordance with the style of the artwork. If you think your artwork may be overpainted, using a UV torch is a good way to identify the affected areas. You can contact us to purchase a conservation UV torch and find out more on how you can use it on your painting. If you would like our recommendations for removing overpaint and a quote, please contact us for further information.